Stop guessing about your primer pockets. Know for sure with the Swage Gage ® primer pocket gage. Gunsmiths use "go" and "no-go" gages to measure chamber tolerances, and now you can bring this level of precision to your reloads with the Swage Gage primer pocket gage. Have you ever wondered if you are swaging or chamfering enough to fully remove a military primer crimp? Wondered if a primer pocket was too loose to hold a primer properly? Wonder no more. I created the prototype of this tool for my own use in brass processing. I needed a way to quickly and easily measure primer pockets that was reliable and did not require wasting a primer. This tool has been indispensable for me and I would never go back to the old method of uncertainty and guessing. One side of this gage is the "go" side which quickly tells you the depth of a primer pocket, whether any crimp is properly removed, and whether the primer pocket is loose. 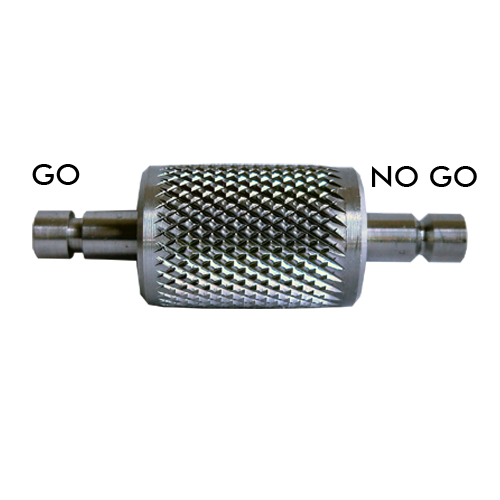 If it feels loose on the "go" side, use the other end of the tool, the "no go" side, to test to see if the primer pocket is too loose to hold a primer. If the no-go slides into the pocket, then you know to junk that brass before it creates the mess that a missing primer can cause. Useful for both precision reloaders who want to be sure of their reloads, and for Dillon 1050 users who need to know whether their auto-swage system is set up properly. Simply seating a primer in a piece of brass doesn't always tell you the whole story, since primers are subject to variations in size, they aren't a precision instrument. 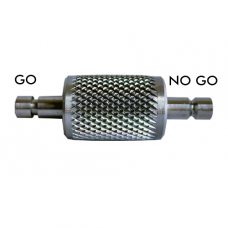 This gage is for all small pistol and small rifle primer pockets. WARNING: This product can expose you to chemicals including nickel (metallic), which is known to the State of California to cause cancer. For more information go to www.P65Warnings.ca.gov.